Mammalian circadian rhythms are driven primarily by the suprachiasmatic nucleus (SCN) of the hypothalamus via a combination of diffusible factors and synaptic interactions. This clock function is usually considered to be the domain of SCN neurons with their circadian expression of genes. This week, Prolo et al. 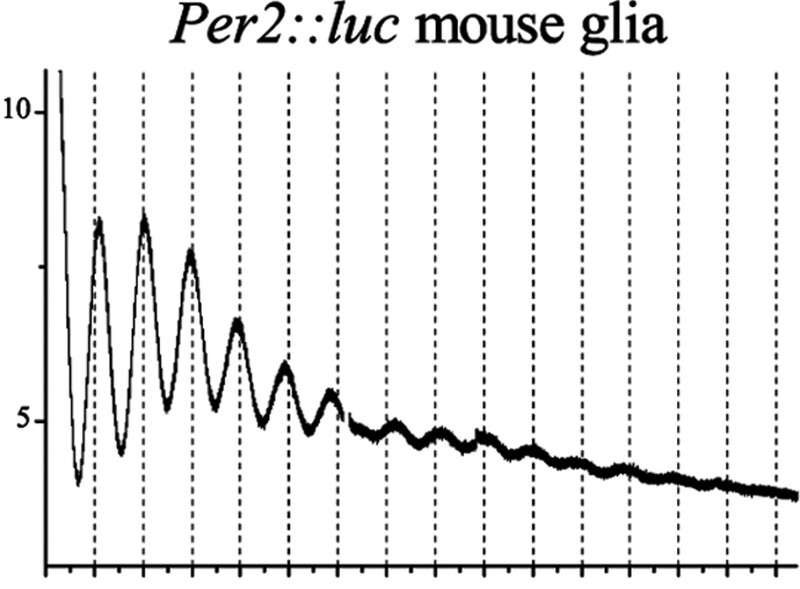 test whether glial cells can also act as circadian oscillators. They coupled the bioluminescent protein luciferase to clock genes, Period 1 in mice or Period 2 in rats. They then examined cultures of cortical astrocytes in the absence of neurons. The astrocytes expressed the circadian genes with a daily rhythm that waned after a week or so. However, the rhythm could be restored with treatments such as a change in media or entrained to cyclic changes in temperature. Glia cocultured with SCN neurons maintained their rhythmicity far longer than with cortical neurons, which the authors suggest may point to a diffusible factor from SCN neurons. Period2::luciferase (Per2::luc) astrocytes in culture show circadian rhythms and a gradual decrease in bioluminescence during the 15 d after initial plating. See the article by Prolo et al. for details. Axonal regeneration begins with a new growth cone emerging from a cut axonal tip. Inhibitory molecules in surrounding myelin and glia are thought to underlie the poor regenerative capacity of central axons, but differences in intrinsic neuronal capabilities may also contribute. This week, Verma et al. examine the importance of local protein synthesis and degradation in axonal regeneration. They severed axons of cultured retinal and dorsal root ganglion (DRG) neurons several hundred micrometers from the soma. As expected, the PNS neurons (DRGs) regenerated more successfully than did CNS (retinal) axons. The ability to regenerate correlated with axonal levels of translational and degradative machinery. Inhibitors of protein synthesis as well as inhibitors of proteasome-mediated degradation slowed or prevented axonal repair, even in axons that were completely isolated from their cell bodies. Inhibition of signaling pathways including target of rapamycin (TOR), p38 mitogen-activated protein kinase, and caspase-3 also reduced local protein synthesis. Inflexibility in responses to stimuli is characteristic of frontal lobe injury as well as schizophrenia and depression. Based on lesion studies, different regions of prefrontal cortex (PFC) have been implicated in such “executive” functions. For example, “reversal learning” tasks involve the orbitofrontal cortex, whereas “set-shifting” attentional tasks involve the lateral PFC. Ascending monoamine inputs are likely modulators of these functions. After serotonin (5-HT)-specific lesions of the orbitofrontal cortex, monkeys perseverate on a serial discrimination task (i.e., they continue to give a previously correct response). This week, Clarke et al. asked marmosets to turn their attention to a set-shifting task. Whereas in a serial discrimination reversal task monkeys are required to respond to a new stimulus, in set-shifting they must shift their attention to a different aspect of the stimulus. After 5,7-dihydroxytryptamine-induced depletion of serotonin in the PFC, the monkeys' ability to set-shift remained unimpaired. The results predict differential actions of serotonin modulation (e.g., by selective serotonin reuptake inhibitors) on frontal lobe functions. This week, Cordle and Landreth examine a novel action of statins beyond their well known ability to lower cholesterol. Statins work by inhibiting the rate-limiting enzyme 3-hydroxy-3-methylglutaryl-coenzyme A reductase in cholesterol synthesis. Population studies in humans also indicate that statins decrease the risk of Alzheimer's disease (AD), an effect that has been attributed to the sensitivity of amyloid precursor protein processing enzymes to membrane cholesterol content. However, the authors suggest that the effect of statins in AD may be anti-inflammatory rather than just lipid-lowering. In cultured THP-1 monocytes, β-amyloid (Aβ) stimulation produced less interleukin-1β, a marker of inflammation in the presence of statins, and Aβ-stimulated microglia produced fewer reactive oxygen species. These effects were independent of cholesterol levels. The authors conclude that depletion of lipid intermediates in cholesterol synthesis, particularly geranylgeranyl pyrophosphate, and downstream inhibition of isoprenylation form the link between statins and a reduction in microglial inflammatory responses in AD. Two actions for the price of one it seems.